William L. McMillan, known as Bill to his many friends, was one of the most creative and distinguished members of the Physics Department of the University of Illinois at Urbana-Champaign. He is noted for his basic and unique contributions to many areas of condensed matter physics, including liquid helium, superconductivity, liquid crystals, layer compounds, spin glasses, and localization phenomena. In many of these areas, he made novel applications of computer techniques to obtain increased physical understanding of complex many-body systems. McMillan was born January 13, 1936, in Little Rock, Arkansas. He died at age 49, at the peak of his productivity. During the past year, he had more than a dozen papers published or in the process of publication. He held a bachelor's degree in electrical engineering and a master's degree in physics from the University of Arkansas, which also awarded him an honorary degree in 1979. He received a doctorate in physics from the University of Illinois in 1964, with a thesis on the ground state of liquid helium, in which he made an early application of Monte Carlo techniques. After graduation, he went to Bell Labs, where he and John Rowell did their famous work on deriving phonon spectra in superconductors from electron tunneling data. On a year's leave at Cavendish Laboratory and at Orsay, he began a study of liquid crystals, using a Landau-type theory to analyze the various phase transitions, and carried out experiments to confirm predictions of the theory. He returned to Illinois as Professor of Physics in 1972, when he was still interested in liquid crystals. In 1978-79, he spent a sabbatical working with Professor P. deGennes at Orsay. An outgrowth of his work on liquid crystals was his theory that discommensurations and commensurate-incommensurate charge density were transitions to 2D layer compounds. This theory is basic to much of the subsequent work in the field. More recently, using in part a novel computer he designed and built himself, he and his students made use of powerful computer techniques to study localization, the metal-insulator transition, Ising models, and other problems of statistical physics. For this work, he developed a new macroscopic renormalization group method in which macroscopic quantities (conductivity, susceptibility, density of states, etc.) are kept fixed as the lattice parameter is varied. This method should have many other applications in the future. 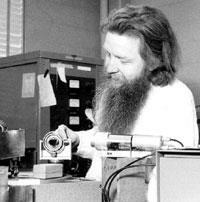 McMillan received the 1978 Fritz London Award for his work with Rowell on phonon spectra in superconductors. His many contributions have been recognized by election to the National Academy of Sciences in 1982 and to the American Academy of Arts and Sciences in 1983.